I love reading your blog. I could use more recipes and how-to's though. I need to know when to send my invites. We skipped save the dates (oops!) and are now somewhat under the gun. The wedding is in February, are we too late? Will our attendance suffer? What do we do? I'd appreciate some help! Okay, on to your question. I know, I've said it a thousand times....but Save the Dates are a really helpful way to get the wedding invite ball rolling. They can also buy you a little time, as well. 1. Address and send out those invites. Right now! Go. Run! 2. Follow up with a phone call. 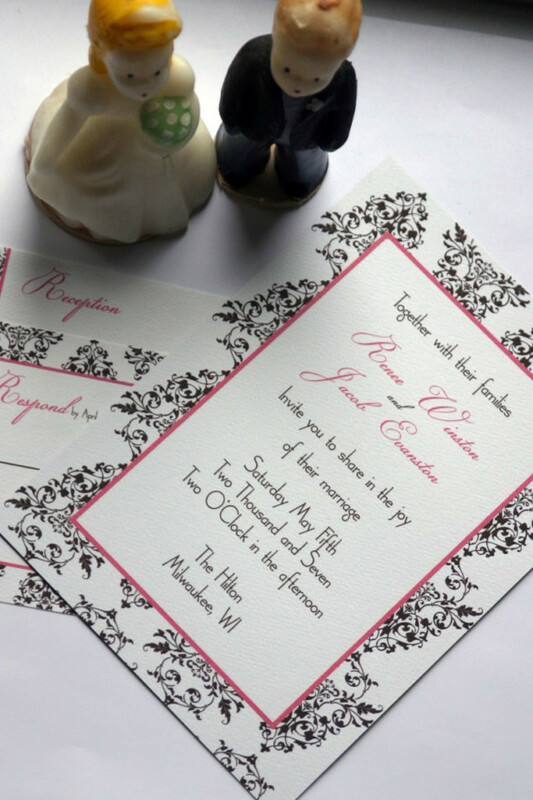 You want to make sure people are getting your invites in a timely manner. Have some extras on hand for lost or misplaced invites. This is also a good time for you to answer any questions your guests might have, so familiarize yourself with the logistics of your wedding. If you are using a planner, you might ask for a short, one page document that lists the most important (and most commonly requested) info. This is a great document to have on hand to e-mail to guests. 3. Keep your eyes on the replies! Because you are getting kind of a late start, you might consider keeping close tabs on your replies. If your "reply by" date is fast approaching and your list of replies is lacking, reach out. Get your attendants and SO to help you. Contact your guests and ask them whether they plan to attend. I hope this helps, doll! Photo Credit: Cracked Designs. I love these so much, they literally kill me dead. Awesome Website, Awesome Blog and Awesome Shop. Hey! I liked 'Holy Matrimony'! What gives? Aren't you concerned about confusing your readers/potential clients? This answer has three parts. 1. I wanted something new and dynamic. I love making a splash! I always have. Goldiluxe started as a little dream I had nearly 4 years ago. The seed grew while I work as a bridal consultant and finally blossomed sometime during the planning of my wedding. I immediately began cultivating, blogging, dreaming and scheming. The closer I got to taking Goldiluxe public, the more I knew I needed something I could really get behind. After brainstorming over 50 titles, meeting with my besties for critiques and copious amounts of soul-searching, Goldiluxe Events and Consulting was born! And you know what? I didn't worry about my readers and clients at all. I deserve something spectacular, something I can be proud of and so do all of you! 2. This year is my golden birthday and Goldiluxe represents a re-birth of sorts. On November 29th, I turned 29. 29!! Can you believe it. I always tend to wax poetic around my birthday in anticipation of another year. This year I took a long, hard look at all the things I've been through, all the things I've learned and experienced and I just felt.......new. New, at 29. Wow. Goldiluxe is a representation of the beautifully luxe life I intend to have. Goldiluxe exists to bring a piece of that spectacular beauty to you. 3. I love gold! I mean, seriously y'all. I LOVE gold. I love the phrase, "You're golden." I love the bittersweet idea of gilded cages. I adore Golden Ages. There was a song we used to sing when I was a Girl Scout that went like..."Make new friends, but keep the old. One is silver and the other gold." I loved that song. I still do. I will teach it to my children, I will sing it until the day I die. Above all, to me the idea of gold is something kind of magical. Something everlasting and wonderful. So, there you have it. A teensy, tiny little window into Goldiluxe Events. I hope you like what you see. I do. Unless you've been living under a rock for the last couple weeks, you know that the scrumptious Prince William is getting hitched! Exciting! The speculations are swirling on the blog-o-sphere about which designer the bride-to-be will choose (Umm, if it were me I'd be dying to get my hot little hands on some Dior...Or Vivienne Westwood). 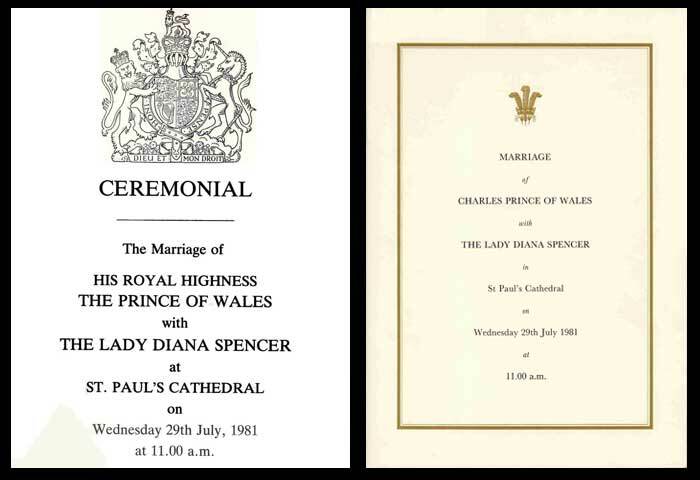 Although I wasn't yet born when the last royal wedding occurred, I did grow up with the images. And being in awe of the spectacular woman that Princess Diana was. 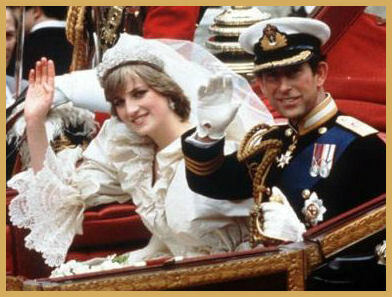 I thought I might share a few of the iconic images with you as we dream about the splendor of the next Royal Wedding..
1. This is the ceremonial announcement. This document announced the order of the procession and outlines the ceremony for the guest. 2. The cake! OMG, can you imagine?! This five layer cake was crafted by petty chef, David Avery (in honor of the Prince's Navy ties) and was a traditional British wedding cake. Fruit cake with raisins, nuts and brandy soaked dried fruit. This is one of several cakes made (the process took 14 weeks to finish...yikes!) in case of an accident. Pretty clever, Royal Family. 4. The dress. Again. 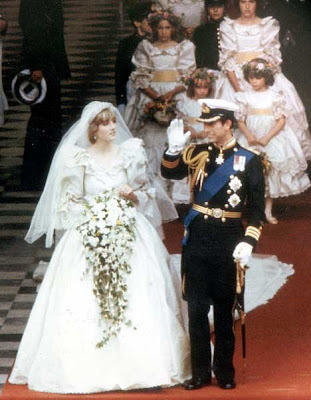 You know, I know it was 1981 and all, but that dress is KILLING me with the beauty. Seriously. In this picture you can see a little bit more of that fab train. Note the nosegay. Something you don't see much with brides today...frankly, I think it's perfect. The little girls? Well, in Britain it is customary that your bridesmaids be young girls from your family. Interesting, no?